Petz Countryside is a fun little learning game for kids. How deep is the learning connection in Petz Countryside? Encyclopedia Britannica Kids is included in Petz Countryside. There are all kinds of interesting animal related information that is included in this Nintendo 3DS hand held video game. If you own Petz Beach you will be familiar with Petz Countryside. Plenty of things are the same. Like what is done, animals adopted, and characters in the town. There are different animals in the two games. There is also a different town layout. Do you enjoy the beach more than the wooded areas? I noticed the graphics in Petz Countryside looked a bit on the grainy side. The 3D effects are okay. Personally I would have preferred better graphics without the 3D. Few of us here at Family Friendly Gaming get into the 3D effects anymore. We wind up spending more time playing games on the Nintendo 2DS than the 3DS. The music and gameplay in Petz Countryside are good. If you play Petz Beach on the same system you play Petz Countryside, then you can skip the tutorial. Which is something I love to do - skipping tutorials. Kids get a real kick out of the animals, and taking care of them. Playing with the animals is also high on the list of things kids like to do while playing Petz Countryside. There are some neat animals represented in Petz Countryside. I am amazed at how far Ubisoft has taken the pet simulation genre. Petz Countryside is far superior to Nintendogs + Cats. I love to see how companies improve upon ideas and take them to the next level. 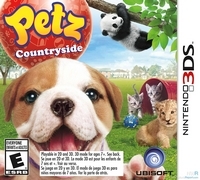 Petz Countryside is a perfect example of moving a franchise in the right direction.